I have a long history with fresh pasta. I made pasta every single day for almost seven years. I've made thousands of tortellini for parties with a thousand guests. One time, I stood on an elaborately built platform at a party, sort of like a stage, and rolled pasta before guests while The Eagles and John Meyer performed a stone's throw away. Another time, I went to China to make a few thousand tortellini at the American Embassy. Chew on that--I went to China to make dumplings. I'm still not over the irony of that one. And I still love making pasta. Some might call me obsessed, and they'd be right. There's something so magical about the way eggs and flour come together into dough that you can roll out into myriad shapes and sizes. I don't think I'll ever stop being fascinated by pasta, and I'd like to share the wonder with you this week, so I'll be focusing on egg noodles in all of their glorious forms. This week's #Eggmonth giveaway is an Imperia pasta rolling machine--one of my own--and two beautiful new cookbooks from Ten Speed Press. Looking at his new book, Mastering Pasta, it's obvious that Marc Vetri has a passion for pasta. He has spent over a decade making fresh pasta at his own restaurant, traveling to Italy, and studying with pasta masters and scholars, including my heroine, Oretta Zanini de Vita. 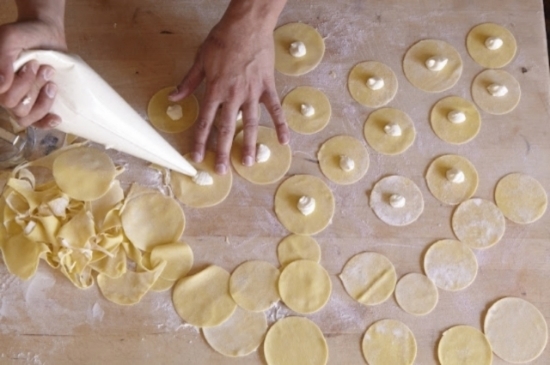 This book will take anyone with an interest in pasta deep into the nuances of the noodle. The second book, The Perfect Egg, is also just out this month, by authors Teri Lyn Fisher and Jenny Park. A paean to the egg and its versatility, this book is beautifully shot and filled with a host of inspiring egg recipes from around the world, including okonomiyaki, tea-eggs, empanadas, egg custards, and marrow and eggs. It'll get you jonesing to cook eggs, in case the rest of #eggmonth hasn't done much for you. Thank you to Ten Speed Press, for contributing the cookbooks for this week's giveaway! To be eligible to win this prize, simply post a photo, recipe, link, or anything else egg-related to Instagram, Facebook, or Twitter and use the #EggMonth hashtag. I'll announce the winner next Monday when I reveal next week's giveaway. And the winner of last week's prize--the gift certificate to Good Eggs and a copy of Egg by Michael Ruhlman, is @seantimberlake. Get in touch with me at ciao (at) saminnosrat (dot) com, and I will send you your prize!